This is where things went downhill. 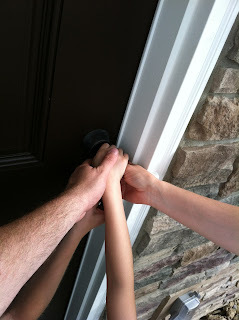 Our oldest child's birthday was the day of the walkthrough and he wanted to be the one to turn the key for the first time. Only problem was, it wouldn't turn. We were given four keys, so we had him try another one. None of them worked! We tried the service door, and again, none of them worked. Our PM was still on vacation and I didn't bring the other PM's number with me. DH looked up the phone number for the model where we picked up the keys. I called the SR there and explained what had happened. She was very apologetic (though it wasn't at all her fault) and told me that she would see what she could do. We took a walk around the house since my parents had not seen the house before. As we got to our neighbor's side of the house, I saw one of the workers that I had met before (on the infamous day of the mud). I asked him if there was anything he could do. He immediately came over and explained that the keys had never been changed from the contractor keys. He got out the manual from his truck and remastered the keys for us. It was a miracle that he was there at 5:00 on the Friday of a holiday weekend. We finally got into the house and were able to show my parents around. We went out to eat and then came back to start moving boxes in. The kids are still in school, so we can't move in fully until school is out. Because of that, I don't have many new pictures since the house is still without furniture. Our first piece of furniture in the house is a counter stool. We bought one to see if we liked it, and we do. 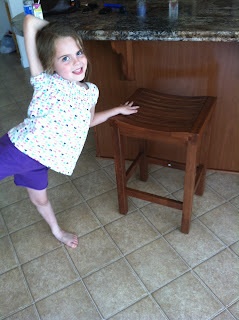 Now I have to order two more counter stools and two bar stools. The next post will contain my first impressions of the house after spending the first day/night there. @ 5 PM on Friday during Holiday weekend. I am sure it is mircale. I guess all your excitement would have gone and you might have been so frustrated by the time you got those locks working. RH should proactively list checking keys to action item list even before doing the final walkthrough.. In the end I am glad that you and your family were able spend some time during the long weekend. Congratrulations! We had to do the key search as well,they sent us to one attorneys office and then to the model in our community. The key was at the model, what a relief. Crazy how it different everywhere. Our PM gave us one set at the final walk through and the second set at closing. Congrats! Your house looks awesome! I love your exterior color choices. We did the same siding/shutter/trim colors, but unfortunately we couldn't afford the partial brick. Yours looks so awesome! Good luck with moving! Love the family effort on the key turn -- sorry it didn't work the first time, but what great luck that someone was around. Congrats!